Ruebel Restaurant: 6.4 mile(s) from Ruebel Restaurant, Full Service, American, Open for: lunch, dinner, Located in downtown Grafton, IL and has an upbeat atmosphere that appeals to all ages. Enjoy classic American Dining at this historic hotel and lounge built in 1832. Pere Marquette Lodge: Pere Marquette Lodge, on premises, Full Service, American, Open for: breakfast, lunch, dinner, Famous for its excellent fried chicken and a variety of other delicious options such as the Marquette Burger, Goat Cliff Soup and yummy Chocolate Pecan Pie! Olive Branch Cafe: 22.1 mile(s) from Olive Branch Cafe, Full Service, American, Open for: breakfast, lunch, dinner, Open daily in Jerseyville, IL, the Olive Branch Caf serves both Italian and American menu items and is a favorite among local families. Red Lobster : 23.8 mile(s) from Red Lobster , Full Service, American, Open for: lunch, dinner, Driven by his passion for fresh seafood and determined to settle for nothing less than exceptional quality and selection, Bill Darden opened his first Red Lobster in 1968. Ragin' Cajun Piano Bar: 21.3 mile(s) from Ragin' Cajun Piano Bar, Bar/Lounge, American, Open for: lunch, dinner, Located in downtown Alton, the Ragin Cajun is a lively joint with a Mardi Gras vibe offering cajun-style grub, playful decor & live piano players. Broadway Oyster Bar: 6.1 mile(s) from Broadway Oyster Bar, Bar/Lounge, Cajun, Open for: lunch, dinner, Featuring some of our Award-Winning Dishes, service, music, and atmosphere, right on the river in Grafton, Illinois. Ciudad Del Sol: 22.9 mile(s) from Ciudad Del Sol, Full Service, Mexican, Open for: lunch, dinner, Open daily for lunch and dinner in Jerseyville, IL. While Mexican food is the primary focus, they also serve charbroiled steaks, sandwiches and other American food. 3rd Chute Bar & Grill: 6.2 mile(s) from 3rd Chute Bar & Grill, Bar/Lounge, American, Open for: lunch, dinner, This riverfront bar & grill offers a varied menu of freshly prepared food and drinks in Grafton, IL. Enjoy patio seating available with view of Illinois River. Aeries Winery: 6.5 mile(s) from Aeries Winery, Bar/Lounge, American, Open for: lunch, dinner, Enjoy a meal or bottle of wine at the Aerie's Riverview Winery located above Grafton, Illinois. Take in the view as you wine and dine. Rock climbing - 1 block(s) from Rock Climbing. Experience the thrill of rock climbing in Pere Marquette State Park. Use your own equipment to scale the cliffs and enjoy the view. Contact the Pere Marquette State Park Visitors Center for more information. Hunting - 1 mile(s) from Hunting, with over 5,000 acres of public hunting areas, Pere Marquette Park is the ideal location to hunt deer, turkey, squirrel, raccoon, coyote and waterfowl. Contact the Pere Marquette State Park Visitors Center for more information. From: Lambert-Saint Louis International Airport. Take I-70 West to Lindbergh Boulevard North. Exit onto I-270 North (to Chicago). Take Route 367 North to Alton, IL and continue into Alton. Turn left off the Alton Bridge and go through three stoplights. Turn left at the third light onto Route 100. Follow Route 100 into Grafton, IL and then 5 miles beyond to Pere Marquette State Park and Lodge. 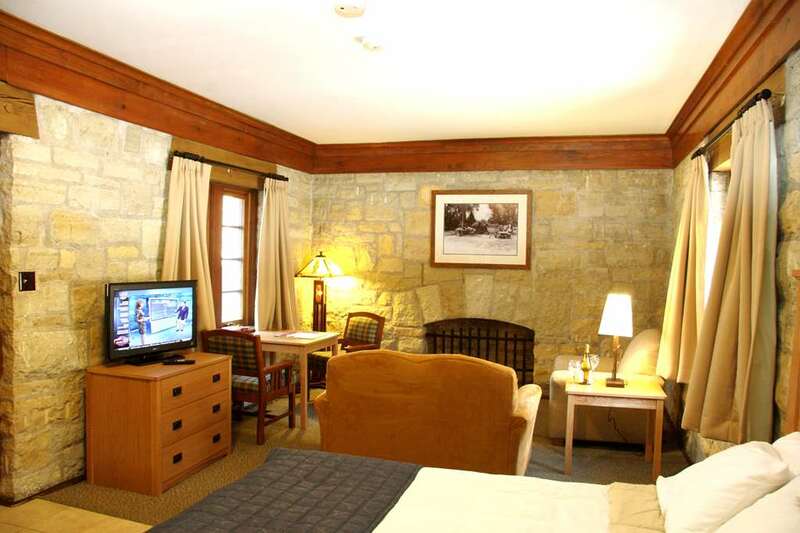 The Pere Marquette Lodge & Conference Center, BW Premier Collection will be on the right just past the campgrounds. From: Chicago or Springfield. Take I-55 South to Litchfield. Exit right onto Route 16 West. Follow Route 16 through Jerseyville and Fieldon to the Route 100 junction. Turn left onto Route 100 South and continue for 10 miles until you reach the Pere Marquette Lodge & Conference Center, BW Premier Collection on your left. The Wood Artisan,6.3 mile(s) from The Wood Artisan, stop by this store to pick up a one of a kind hand-made clock in Grafton, IL. Bring your clocks in for repair or get one custom made. This shop features Kit-Cat Clocks, Cuckoo Clocks and more. Suttons Shop,6.5 mile(s) from Suttons Shop, visit this Grafton landmark and step into a year-round yard sale. This winding store offers character by the bucket with everything from rusty forks to old wooden chairs. Knotty by Nature,6.4 mile(s) from Knotty by Nature, this specialty wood shop features custom made wooden pieces for sale. Visitors can also purchase materials to do it yourself at this unique shop in Grafton, IL. Wild N Crazzy,6.4 mile(s) from Wild N Crazzy, celebrate your inner biker at Wild N Crazzy in downtown Grafton, IL. Walk in and stock up on your favorite biker apparel, sunglasses and accessories. Alton Square Mall,22.3 mile(s) from Alton Square Mall, shop till you drop with over 30 stores including major retailers like Macy's and JCPenney. Enjoy dining at any of the several restaurants in the mall including Olga's, the Cookie Factory or The Philly Shack. A U.S.
Grafton Winery & Brewhaus,6.1 mile(s) from Grafton Winery & Brewhaus, along with delicious food and drink, the Grafton Winery also offers guests a unique gift shop full of gifts for wine enthusiasts. Harrisons Antiques,6.4 mile(s) from Harrisons Antiques, features over 3,000 square feet of indoor and outdoor home decor. One room is filled with jewelry, hair bows, ribbons and holiday items. Aeries Grounds and Gifts,6.5 mile(s) from Aeries Grounds and Gifts, this gift shop is located on a bluff high above Grafton and features specialty coffees and specialty gifts. The White Pelican Art Gallery,6.4 mile(s) from The White Pelican Art Gallery, features local, handmade and fine art with over 27 artists displayed from Illinois and Missouri. Jeni J's,6.1 mile(s) from Jeni J's, is a boutique in Grafton that offers Berek, Christine Alexander, Cactus Bay and Festa Stuff clothing along with Tyler candles, lavish Jewelry and St. Louis Cardinal Merchandise. Pajarito Native American,6.5 mile(s) from Pajarito Native American, purchase authentic Native American products in downtown Grafton, IL. This shop is a must see with apparel, treasures, collectables and more. Vintage Vanilla,6.4 mile(s) from Vintage Vanilla, this gift shop is located in downtown Grafton and offers a variety of items for the home and heart. Peruse new and repurposed furniture, antiques, candles, soaps and gifts. Golden Eagle Antiques,6.4 mile(s) from Golden Eagle Antiques, located in downtown Grafton, IL, Golden Eagle Antiques features refinished furniture, mid-century treasures and more. Eckert's Country Store & Farms,10.1 mile(s) from Eckert's Country Store & Farms, offers guest favorites, including Eckert s fresh produce, apple cider, apple and pumpkin butter, honey, Amish salsas, jams and jellies and limited bakery treats from our Belleville bakery department. Grafton Zipline,6.5 mile(s) from Grafton Zipline, looking for a jaw dropping, heart racing experience? Try Grafton's thrilling attraction a zip line that affords those brave enough a stunning river view and hours of fun. It's one of the largest zip lines in Illinois. Pere Marquette Stables,1.0 mile(s) from Pere Marquette Stables, open to the public Wednesday through Monday, May through October. Located just 3 miles south of Pere Marquette Lodge on the Great River Road, the Stables offer adventurers a chance to see the park on horseback. Grafton Visitors Center,7.0 mile(s) from Grafton Visitors Center, learn the history of Grafton and all it has to offer! Enjoy the view of the Great Mississippi river and educate yourself on the meeting of the Great Rivers National Scenic Byway. Argosy Casino Alton,21.4 mile(s) from Argosy Casino Alton, offers three floors of gaming action, featuring more than 1,000 of your favorite slots (from penny to $25 machines) plus Blackjack, Craps, Roulette and other exciting table games. Enjoy buffet and restaurant dining.